Glencoe sweeps with beauty, myth, romance and history. Carved out by glaciers and volcanic explosions thousands of years ago, the deep valley and bleak looming mountains have long inspired storytellers and artists. The site of the infamous massacre of 1692, the home of the Celtic hero Fingal and a location in films like Skyfall and Harry Potter, Glencoe's untamed and beautiful landscape is the ideal setting for a rural escape or an outdoor adventure holiday. Whether you're sampling cask ale at an inn, jumping off a waterfall or kayaking on Loch Leven, you will find yourself mesmerised by the wild tranquillity of the area, and our collection of the best places to stay in Glencoe are set within particularly scenic parts of this landscape. Set within the Lochaber Geopark - known as the Outdoor Capital of the UK - Glencoe village stands between the shores of Loch Leven and the mouth of the glen itself. Before 1692, Glencoe was in the hands of the MacDonald clan, who had been gifted these lands by Robert the Bruce. During the Civil War, they were visited by their worst enemies - the Campbells - and adhering to the Highland code of hospitality, they gave them food and shelter for several weeks, culminating in the slaughter of over 40 MacDonald clan members. This tragedy enshrined Glencoe in history and led to the famous Scottish saying, "never trust a Campbell." Celtic mythology also details that Glencoe was the home of the great Celtic hero Fingal - the leader of the Feinn warriors. These days Glencoe is better known as the beating heart of the outdoor adventure scene in the UK, offering holidaymakers everything from kayaking on Loch Leven, hiking Munros, mountain biking in Fort William and golfing in Ballachulish to climbing ice walls in Kinlochleven, jumping down waterfalls in Onich and skiing in the Glencoe Mountain Resort. Walking the bleak expanse of Rannoch Moor, climbing the Devil's Stair and the Buachaille Etive Mor is a must, providing spectacularly sublime views of the wild Highland scenery. Walk through the bleak expanse of Rannoch Moor and hike a few Munros. Do a spot of horse riding at the Lettershuna Riding Centre. Take the Jacobite Steam Train from Fort William - the one used in Harry Potter - and see the gorgeous landscape. Jump down a waterfall in Onich with the company Vertical Descents. Head over to the Dragon's Tooth Golf Course in Ballachulish for a bit of golf. Go kayaking on Loch Leven. This is a popular spot so to ensure you bag a spot at one of best places to stay in Glencoe be ready to book well in advance. 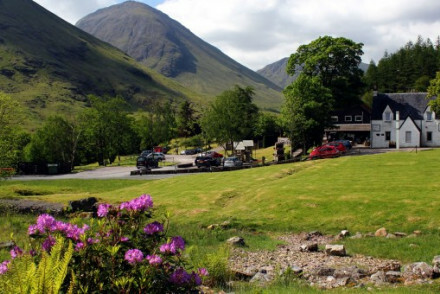 Clachaig Inn: a great starting point for exploring Glencoe, this delightful country inn is in a great location - nestled sweetly in the heart of the glen - and is centred around a hearty, traditional pub, which often hosts folk music sessions. Perfect for couples on a weekend away. 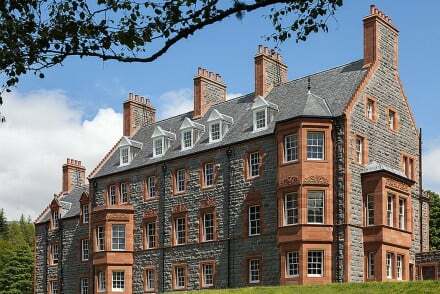 Glencoe House: formerly the home of Lord Strathcona, this gorgeous mansion overlooks Loch Linnhe, offering 7 spacious and comfortable contemporary suites. Our partner Booking.com has a wide range of apartments and cottages in the nearby area. Fly to Glasgow International Airport and get a train to Fort William, disembarking at Crianlarich or Bridge of Orchy, from where you can take a bus. The best time to go is during the summer when the temperature averages between 10 and 18 degrees. Tucked into Glencoe, the Clachaig Inn is a charming hotel. The hotel's hub is formed around the atmospheric pub that offers a great selection of beers and whiskies, often playing host to traditional music sessions. A great launchpad for exploring the surrounding beauty of Glencoe. Kayaking - Glencoe is full of kayaking opportunities.